Mostly of the west coast of Zakynthos island is characterized from high cliff that fall straight into the sea and from unforgettable sunsets. 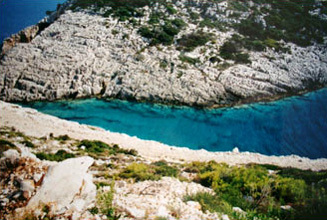 There are a pair of spectacular places you can reach by car that you can't miss to visit during your stay in Zante. 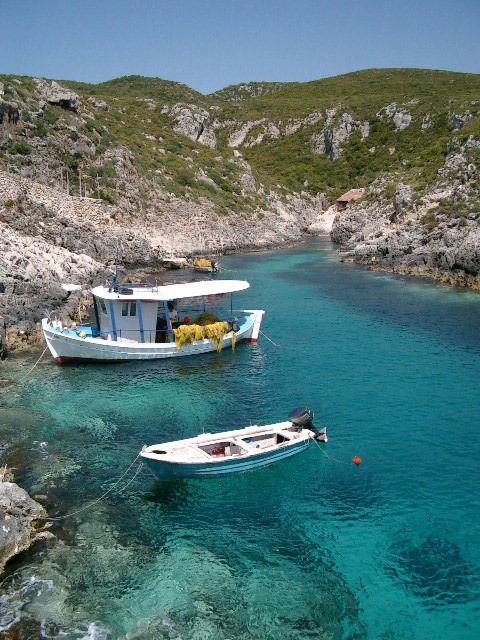 Our daily trip starts from the city of Zante in Itinerary - Shipwreck and West coast order to cross the island for its breadth and take you to the mountain village of Aghios Leon. The way that we suggest you to follow is the road that, before arriving to Aghios Leon, pass through the villages of Macherado and Kiliomeno. In Macherado there is the interesting Eleftheotria monastery, after that the road will lead you to Kiliomeno giving you one of the most beautiful panoramas of the day. Be ready with your camera because the natural environment you will see today will be incredible! Once arrived to Aghios Leon you'll find two roads that go down towards the sea and they lead respective to Porto Roxa and Porto Limnionas. In these two wonderful and small fjords the sea is extremely clean and you can see up to the infinite the blue of the sea. Porto Roxa is equipped with some deck-chairs placed just over the water and a trampoline, while Porto Limniona is larger and colorful with evocative sea caves in the vicinities. 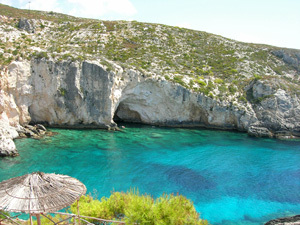 We suggest you to visit both of them and to enjoy your time here for all the afternoon swimming with mask and snorkel. The emotions are great, but the most marvellous show still has to come. In the late afternoon go back to your car and drive in direction of Maries and then reach Anafonitria. This high coastal road is truly unique although it is distant from the sea; it crosses kilometers of forest and country side. The rural scene surrounded by an unbelievable peace and quiet will accompany you until Anafonitria. Here we suggest you not to buy anything from the several carpets and table-clothes that you will be offered (all made in Taiwan), but don’t miss the different spices and the various types of honey that are exceptional. Passed Anafonitria, the road continues for Volimes but between the two countries you can visit the St. George Krimnon monastery. Then take the only road on your left in order to go to admire the Shipwreck. This road leads you directly to a panoramic and desolated parking. Here, from a breathtaking iron balcony, you will be able to see and to photograph what is considered one of the 30 most beautiful beaches over the world. If you can program very well your time and you’re able to arrive here for the sunset time... it will be something you’ll never forget! The beach of Navagio is possible to be reached only by the sea from Porto Vromi and Aghios Nikolaos, but often the boats do not leave for the bad conditions of the sea. 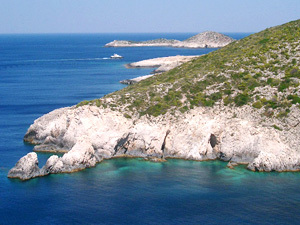 For those who are interested, we suggest to arrive soon in the morning in Porto Vromi or Aghios Nikolaos. 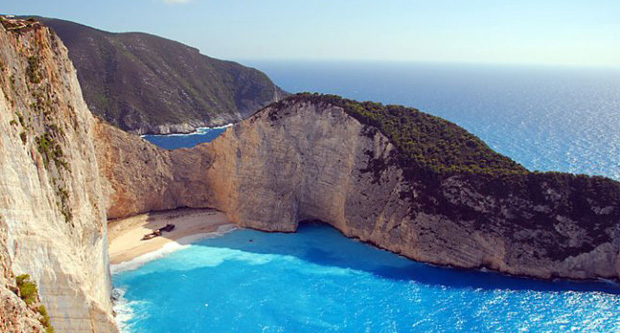 We suggest you also a great alternative choice to Navagio for a marvellous sunset. You just have to reach the mountain village of Kampi. Here straight above the sea you will find a great cross that reminds all the people died during the war. The view over the monk seal bay is really stunning and you can admire the mountain that goes down into the blue Ionian sea. 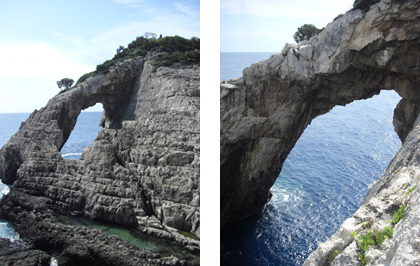 Korakonissi is a fiord on the western coast of the island and gives its name to the presence of a small island with a long shape, connected to the mainland by a huge natural rock arch. Located in the south part of the Porto Limnionas it is reachable only by a jeep driving along a rough road that leaves from the town of Kiliomeno, the best suggestion we can give you is to take a supply of water since there are no abodes, petrol stations etc. from there to the next inhabited area. The small island creates together with the mainland a tiny natural fiord rich of starfish and sea urchins where the waters have wonderful colours. If from the part of the island facing the open sea you swim for 10/15 minutes to the left you reach a cave wonderful for its colours and the concretions on the walls; there you can walk since the water isn’t more than 30 cm deep. The adventure doesn’t consist in visiting the small cave; your task is to go up to the top of the natural bridge and try to dive.